Amid the barrage of news about climate-related natural disasters and climate change summits, it’s important to recognize real inflection points—when there is truly cause to sit up and take note. The IPCC Special Report on Global Warming of 1.5ºC, released last month, is a genuine wake up call. We are already at one degree Celsius warming beyond pre-industrial averages. Limiting global warming to 1.5 degrees Celsius (2.7 degrees Fahrenheit)—beyond which scientists expect more significant damage to global ecosystems—requires “rapid and far-reaching transitions” in energy systems, land use, industry and urban infrastructure, concludes the special report. In short, we need to live and build differently. Those of us focused on cities know this is true. 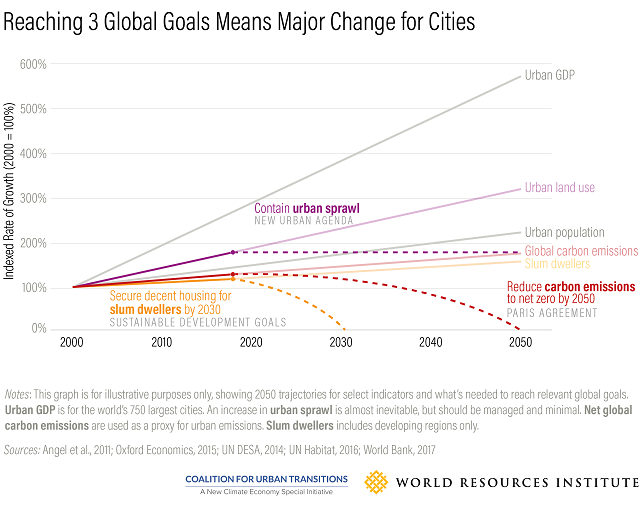 The trajectory for major trends needs to change significantly in urban areas to reach the targets agreed to by the world’s governments in the Paris Agreement, Sustainable Development Goals and New Urban Agenda. We need not just nudges and tweaks, but transformation on a massive scale, starting now. The IPCC special report, a synthesis of the latest climate research collected by 91 authors, reinforces this message comprehensively. From reducing emissions to expanding economic opportunities for all, cities are key to a sustainable future. Big changes to the built environment are needed to stay under 1.5 degrees. We must build smarter and retrofit faster. Emissions from buildings must be reduced 80-90 percent by mid-century, and all new construction must be “fossil-free and near-zero energy” in just two years. These changes need to happen everywhere. In the developed world, we need to see optimization and decarbonization of existing services. In the developing world, we need to provide new services—including roads, water, sanitation and electricity—to the underserved, and cities need to build these services differently from those of the past. New solutions need to be adopted quickly since the infrastructure being constructed today will last decades. This is a challenge, but also a significant opportunity to reshape cities—some 75 percent of the infrastructure expected to be in place by 2050 has yet to be built. At two degrees of warming by 2040, more than 70 percent of coastlines will see sea level rise greater than 0.2 meters (8 inches). 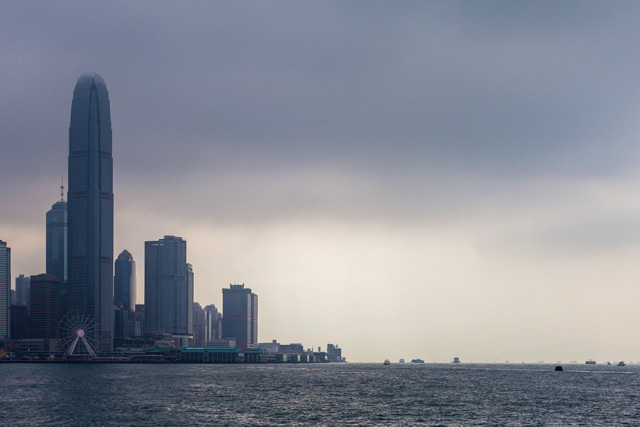 Among the places hardest hit by flooding will be dense urban areas, including at least 136 “megacities” (defined as “port cities with a population greater than one million in 2005”). That doesn’t include new cities that will enter this category due to population growth in the next few decades. At two degrees, without changes to the built environment like cooler roofs and greener urban design, cities like Karachi and Kolkata can expect deadly heatwaves like the ones in 2015 that killed thousands. It’s not just the physical changes of a warming world that are alarming; it’s the social and economic implications. Climate change is a “poverty-multiplier that makes poor people poorer and increases the poverty head count,” the report says. Cities are especially vulnerable to these trends in part because the number of people living in “informal” settlements—areas often beyond the scope of basic services and municipal assistance—is expected to triple to 3 billion by 2050. The risk for cities already struggling with the effects of inequality is that reaching these populations becomes even more difficult, not only putting millions of people at risk of destitution and literal drowning but dragging down urban and national economies writ large. A much larger emphasis on governance, equity and “broad participation” will need to be considered to reduce urban risks. Even well-intentioned adaptation efforts can backfire if they end up further marginalizing or displacing poor citizens. Our World Resources Report, “Towards a More Equal City,” suggests ways to build cities for all by outlining equity challenges sector by sector as well as exploring practical approaches that are already working in cities around the world. The IPCC report is a call for transformation on a massive scale—not just in energy or climate policy but how we live and build generally. Though it’s easy to focus on the potential costs of such a change, the benefits could be significant, too. The authors note urban “green economies” are emerging from the informal sector, helping to meet demand for clean water, for example, and improve recycling. And cities in Africa and Asia have the potential to leapfrog traditional ways of generating electricity, bringing cleaner energy to more citizens and improving adaptive capacity at the same time (here, the report cites WRI’s own work on powering cities in the global south). Estimates of the net value of low-carbon investments in cities are as high as $16.6 trillion by 2050, according to the Coalition for Urban Transitions. The furious pace of urbanization gives us an opportunity to make rapid changes. A window for transformation is opening, and it’s up to us to seize it. Cities are the best chance we have to get this right. Ani Dasgupta is Global Director of WRI Ross Center for Sustainable Cities. Catlyne Haddaoui contributed to this article.